There's a certain subset of people that find the Mercedes-Benz ML63 AMG, the Porsche Cayenne Turbo, and the old BMW X5M and goes, "no, those are German. I want something tasting more of... the Queen." 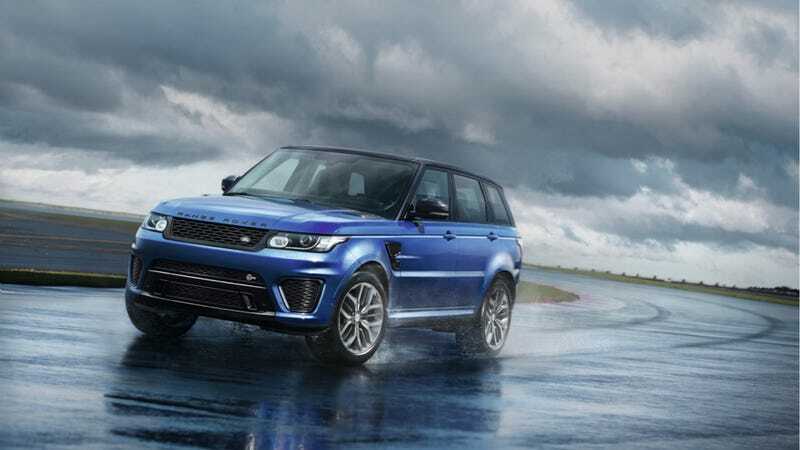 Enter the new Range Rover Sport SVR, with 550 horsepower. But it's those certain intangibles that Range Rover hopes will make all the difference. It was designed, engineered, and will be built, in Britain. The exhaust sounds better, and has actually been tuned to provide a crackle on the overrun during deceleration, much like a high-end Ferrari or a slightly less high-end Fiat 500 Abarth. The steering has received additional weighting, for more precision. The transmission should shift more quickly. It has new seats, to provide additional lateral support. Okay, so it won't all be quite as fast the Cayenne Turbo, but does it matter? The Range Rover was the first SUV to make no compromises. It could take you anywhere you wanted in the entire world, without sacrificing one iota of luxury. And now it won't be sacrificing much on the track, either.